The term “anarcho-capitalism” has, we might say, rather an arresting quality. But while the term itself may jolt the newcomer, the ideas it embodies are compelling and attractive, and represent the culmination of a long development of thought. If I had to boil it down to a handful of insights, they would be these: (1) each human being, to use John Locke’s formulation, “has a property in his own person”; (2) there ought to be a single moral code binding all people, whether they are employed by the State or not; and (3) society can run itself without central direction. In violating individual rights, the State tries to claim exemption from the moral laws we take for granted in all other areas of life. What would be called theft if carried out by a private individual is taxation for the State. What would be called kidnapping is the military draft for the State. What would be called mass murder for anyone else is war for the State. In each case, the State gets away with moral enormities because the public has been conditioned to believe that the State is a law unto itself, and can’t be held to the same moral standards we apply to ourselves. But it’s the third of these ideas I’d like to develop at greater length. In those passages of their moral treatises dealing with economics, the Late Scholastics, particularly in the sixteenth and seventeenth centuries, had been groping toward the idea of laws that govern the social order. They discovered necessary cause-and-effect relationships. There was a clear connection, for example, between the flow of precious metals entering Spain from the New World on the one hand, and the phenomenon of price inflation on the other. They began to understand that these social regularities were brute facts that could not be defied by the political authority. This insight developed into fuller maturity with the classical liberals of the eighteenth century, and the gradual emergence of economics as a full-fledged, independent discipline. This, said Ludwig von Mises, is why dictators hate the economists. True economists tell the ruler that there are limits to what he can accomplish by his sheer force of will, and that he cannot override economic law. For if there are general laws that act independently of written laws, and whose action needs merely to be regularized by the latter, we must study these general laws; they can be the object of scientific investigation, and therefore there is such a thing as the science of political economy. If, on the contrary, society is a human invention, if men are only inert matter to which a great genius, as Rousseau says, must impart feeling and will, movement and life, then there is no such science as political economy: there is only an indefinite number of possible and contingent arrangements, and the fate of nations depends on the founding father to whom chance has entrusted their destiny. The next step in the development of what would later become anarcho-capitalism was the radical one aken by Gustave de Molinari, in his essay “The Private Production of Security.” Molinari asked if the production of defense services, which even the classical liberals took for granted had to be carried out by the State, might be accomplished by private firms under market competition. Molinari made express reference to the insight we have been developing thus far, that society operates according to fixed, intelligible laws. If this is so, he said, then the provision of this service ought to be subject to the same laws of free competition that govern the production of all other goods. Wouldn’t the problems of monopoly exist with any monopoly, even the State’s that we have been conditioned to believe is unavoidable and benign? It offends reason to believe that a well-established natural law can admit of exceptions. A natural law must hold everywhere and always, or be invalid. I cannot believe, for example, that the universal law of gravitation, which governs the physical world, is ever suspended in any instance or at any point of the universe. Now I consider economic laws comparable to natural laws, and I have just as much faith in the The Left, The Right an... Llewellyn H. Rockwell Jr Best Price: $2.42 Buy New $68.93 (as of 10:45 EDT - Details) principle of the division of labor as I have in the universal law of gravitation. I believe that while these principles can be disturbed, they admit of no exceptions. It was Murray N. Rothbard who developed the coherent, consistent, and rigorous system of thought – out of classical liberalism, American individualist anarchism, and Austrian economics – that he called anarcho-capitalism. 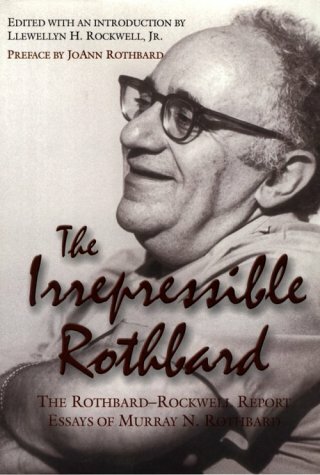 In a career of dozens of books and thousands of articles, Rothbard subjected the State to an incisive, withering analysis, unlike anything seen before. I dedicated Against the State to this great pioneer, and dear friend. But can it work? 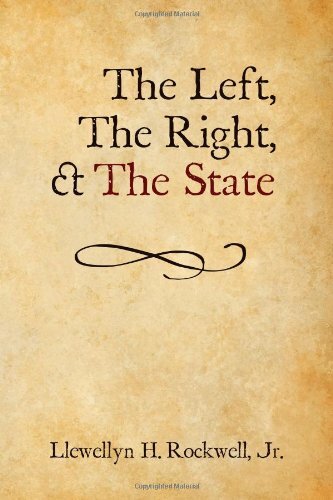 It is all very well to raise moral and philosophical objections to the State, but we are going to need a plausible scenario by which society regulates itself in the absence of the State, even in the areas of law and defense. These are serious and difficult questions, and glib answers will naturally be inadequate, but I want to propose at least a few suggestive ideas. The conventional wisdom, of course, is that without a monopoly provider of these services, we will revert to the Hobbesian state of nature, in which everyone is at war with everyone else and life is “solitary, poor, nasty, brutish, and short.” A ceaseless series of assaults of one person against another ensues, and society sinks ever deeper into barbarism. For one thing, it’s not even clear that the logic behind Thomas Hobbes’s fears really makes any sense. 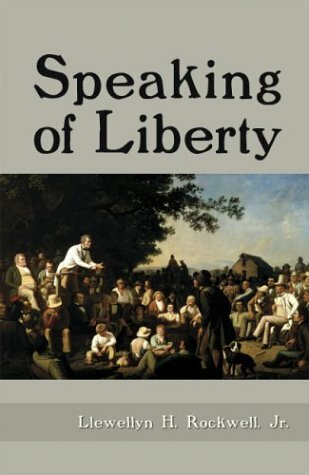 As Michael Huemer points out, Hobbes posits a rough equality among human beings in that none of us is totally Speaking of Liberty Llewellyn H. Rockwell Jr. Best Price: $1.80 Buy New $2.48 (as of 08:35 EDT - Details) invulnerable. We are all potential murder victims at the hands of anyone else, he says. He likewise insists that human beings are motivated by, and indeed altogether obsessed with, self-interest. Now suppose that were true: all we care about is our own self-interest, our own well-being, our own security. Would it make sense for us to rush out and attack other people, if we have a 50 percent chance of being killed ourselves? Even if we happen to be skilled in battle, there is still a significant chance that any attack we launch will end in our death. How does this advance our self-interest? Hobbes likewise speaks of pre-emptive attacks, that people will attack others out of a fear that those others may first attack them. If this is true, then it’s even more irrational for people to go around attacking others: if their fellows are inclined to preemptively attack people they fear, whom would they fear more than people who go around indiscriminately attacking people? In other words, the more you attack people, the more you open yourself up to preemptive attacks by others. So here we see another reason that it makes no sense, from the point of view of the very self-interest Hobbes insists everyone is motivated by, for people to behave the way he insists they must. It was once common to conceive of law as something discovered rather than made. In other words, the principles that constitute justice and by which people live harmoniously together are derived from a combination of reflection on eternal principles and the practical application of those principles to particular cases. The idea that a legislative body could overturn the laws of contract and declare that, say, a landlord had to limit rents to amounts deemed acceptable by the State, would have seemed incredible. The English common law, for example, was a bottom-up system. In the Middle Ages, merchant law developed without the State at all. And in the US today, private arbitration services have exploded as people and firms seek out alternatives to a government court system, staffed in many cases by political appointees, that everyone knows to be inefficient, time-consuming, and frequently unjust. PayPal is an excellent example of how the private, entrepreneurial sector devises creative ways around the State’s incompetence in guaranteeing the inviolability of property and contract. For a long time, PayPal had to deal with anonymous perpetrators of fraud all over the world. The company would track down the wrongdoers and report them to the FBI. And nothing ever happened. Despairing of any government solution, PayPal came up with an ingenious approach: it devised a system for preemptively determining whether a given transaction was likely to be fraudulent. This way, there would be no bad guys to be tracked down, since their criminal activity would be prevented before it could do any harm. Small miracles like this take place all the time in the free sector of society, not that we’re encouraged to learn much about them. Recall that as the Centers for Disease Control issued false statements and inadequate protocols for dealing with Ebola, it was a Firestone company town in Liberia that did more than any public authority in Africa to provide safety and health for the local population. 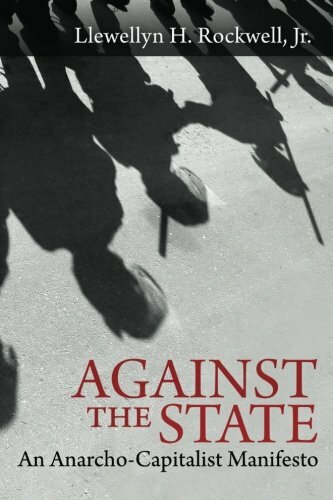 There is a great deal more to be said about law and defense provision in a free society, and I discuss some of this literature at the end of Against the State. But the reason we focus on these issues in the first place is that we realize the State cannot be reformed. The State is a monopolist of aggressive violence and a massive wealth-transfer mechanism, and it is doing precisely what is in its nature to do. The utopian dream of “limited government” cannot be realized, since government has no interest in remaining limited. A smaller version of what we have now, while preferable, cannot be a stable, long-term solution. So we need to conceive of how we could live without the State or its parasitism at all. The point of this book is to speak frankly – at times perhaps even shockingly so – in order to jolt readers out of the intellectual torpor in which the ruling class and its system of youth indoctrination have lulled them. 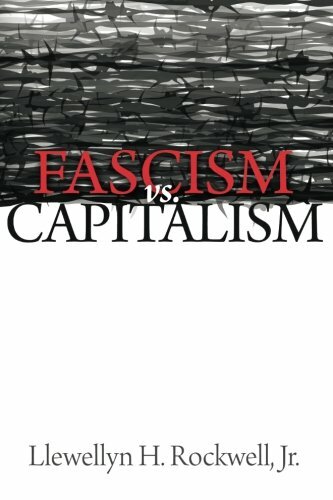 We might have a fighting chance if most people were aware of the ideas in this book, and in our intellectual tradition generally. They would never fall for the State’s propaganda line, its apologias, its moral double standards. They would be insulted by these distortions and dissimulations. And that’s what we do at the Mises Institute. We don’t publish “policy reports” in the vain hope that Congress will defy its own nature and pursue freedom. Every one of those policy reports winds up in the trash can. They are used to dupe the gullible into thinking the Washington think-tanks they support have influence in Washington. Instead, we set forth the truth about the State without compromise or apology. The reason Ron Paul attracted so many young people was that they could see he was speaking to them in plain English, not politicalese. He was speaking frankly and truthfully, without regard for the lectures and hectoring he’d get for it at the hands of the media. We’ve tried to emulate Ron’s approach – and of course, we’ve been delighted to have Ron as a Distinguished Counselor to the Institute since its inception, and as a member of our board as well. The stakes are too high for us to do anything other than speak frankly and directly about what we know to be true. It’s easy to publish toothless essays about public policy. It is harder to focus on war, the Federal Reserve, and the true nature of the State itself. But that is the path we have willingly chosen.